Are you a movie lover wanting your home entertainment system to wow you? Here at Home Media, we can help you experience the majesty of a home cinema installation in Kent that guarantees an immersive experience. Our bespoke projects make sure every aspect of your system comes together, from perfectly-calibrated sound and mood lighting all the way through to refined seating. All of which works together to deliver a luxurious, seamless and discreet home theatre. 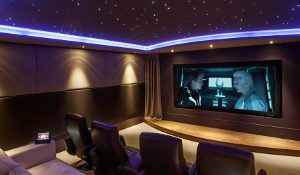 Experience the majesty of a cinema-esque home theatre by transforming any room in your property, from your lounge through to an attic or garage conversion; there are no limits. Simply let our experts arrange a suitable time for a site visit and they’ll tailor your project to fit your exact specification. We make it our goal to provide the very highest quality equipment available within your budget and design a bespoke system built around the dimensions of your chosen space. Drop by the store for a chat and a demonstration of equipment, or give our friendly team a call to arrange a site visit on 01622 676703.